Many of you would of read my recent article about the new Fibre One products hitting the shelves. 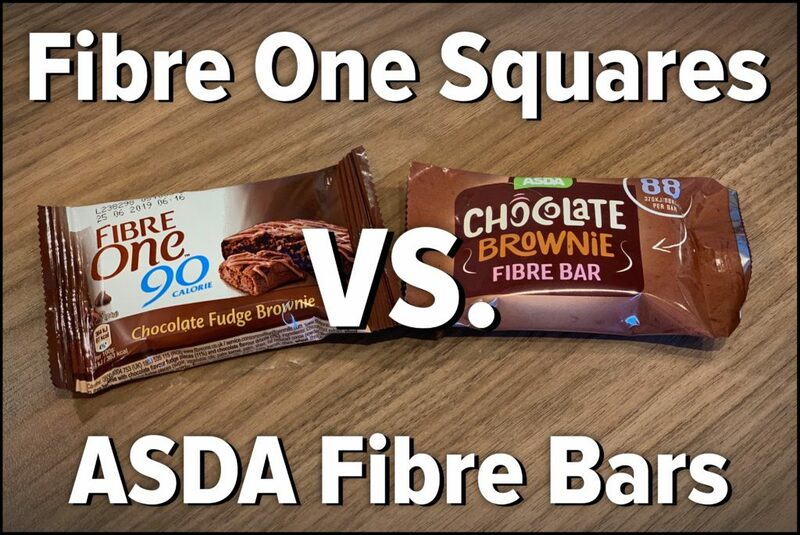 Since the article quite a number of my followers have brought the newish Asda Fibre one bars to my attention. Since joining Slimming World those many years ago I have learned to appreciate the occasional little treats. Yes these bars may not be a huge slab of sticky chocolate fudge cake full of sugar (drools). But they are a tasty low Syn/calorie alternative which can give me the sweet fix I am craving and also to stop me from cheating. I constantly read mixed reviews on the fibre one products. Some think they are amazing and some think they are too bitter. 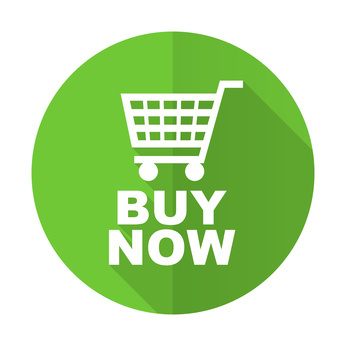 Everyone’s taste differ but I wanted to give you all a review on a cheaper alternative product. 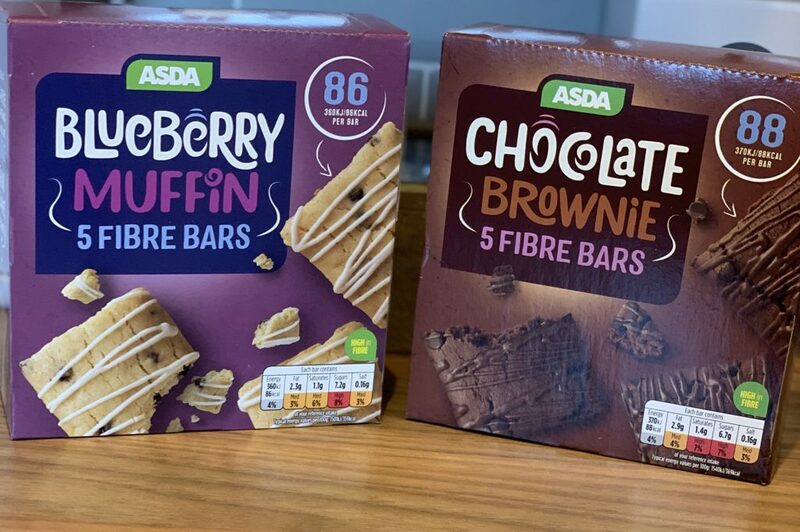 Last year saw the release from Asda of the Chocolate Brownie and Blueberry Muffin fibre bars. I must have missed this release (maybe because I don’t usually shop in Asda). So of course I was happy when my followers brought these to my attention. I scooted off down to Asda and grabbed myself a box of each to sample and I was pleasantly surprised. The first big difference is the cost.. only £1.25 for a box of 5 bars. Their rival from Fibre One are anything between £2.40 and £3.50 depending on where you shop. BUT they are regularly on offer. At the moment Asda are price matching the Fibre One boxes at £1.25. The second difference is nutrition.. 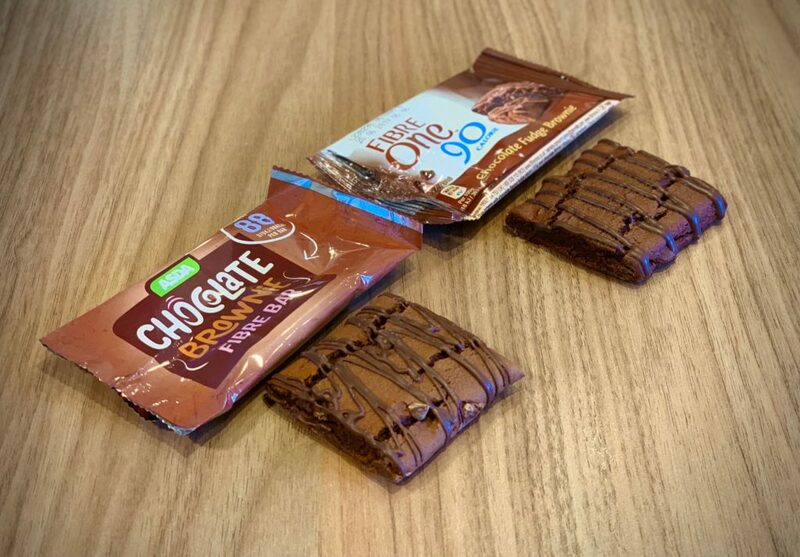 The Asda Chocolate Brownie fibre bars are 1 calorie extra over the Fibre one chocolate brownies. However they are both 4 Syns per cake. 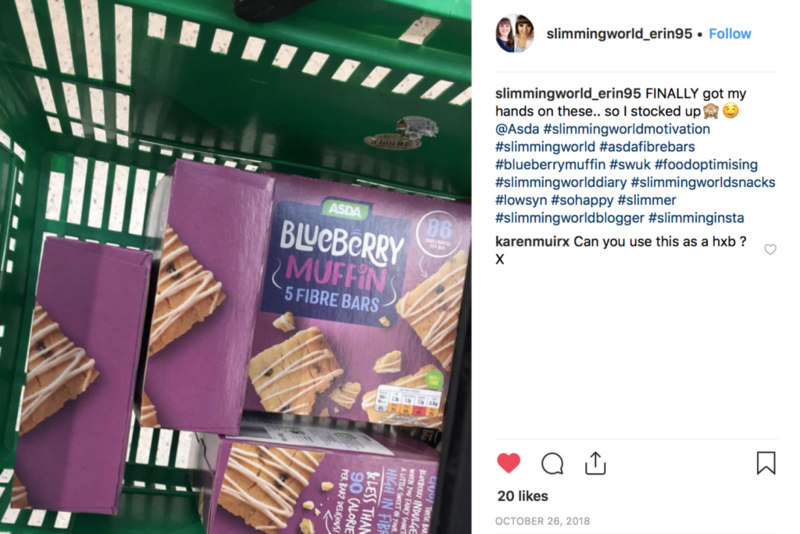 Which means for Slimming World followers there is not much in it. 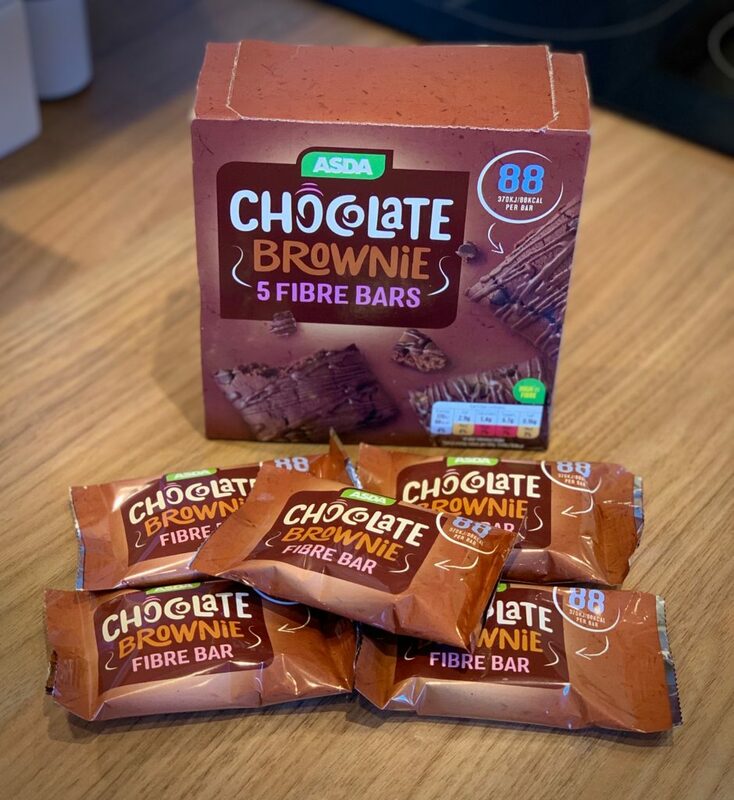 But for the followers who are aware of other nutritional content, the Asda version contains LESS sugar, fat, salt and MORE fibre. I personally think the extra calorie is worth the decrease in sugar, fat and salt. As most of you know I am hugely aware of sugar content in products as I believe sugar is a huge factor in making us so overweight in the first place. I must also mention that both bars are the same size/weight. So Asda fibre bars definitely win that round for me. Thirdly let’s talk about the taste… As much as I have always enjoyed Fibre One Brownies I have always found them a bit.. how do I describe it? Sticky? You know when you eat something and then spend the next half an hour scraping it off of the roof of your mouth and teeth? Don’t get me wrong they are tasty but I have always preferred to heat them for 30 seconds in the microwave and add a dollop of Low calorie ice-cream. The first thing I noticed from the Asda bars is that they didn’t have the same “sticky” texture, they had more spongy cake feeling to them. I don’t feel I would need to heat them up as often. I would be happy to eat them as they are. I also “forced” Mr Fatgirlskinny (the poor boy) to sample both of them too. He felt that the Asda version tasted sweeter and because there seemed to be more chocolate chips in the mixture it also felt like he was eating something naughtier. I would have to agree. I often find the fibre one Bars leave quite a bitter aftertaste. I definitely did not get this with the Asda version. Overall I prefer the cost, the nutritional information and the taste of the Asda version.. So for me ASDA WINS!! Obviously I appreciate that everyone has a different opinion and this is just my own. But if you are in Asda give them a try I don’t think you will be disappointed. 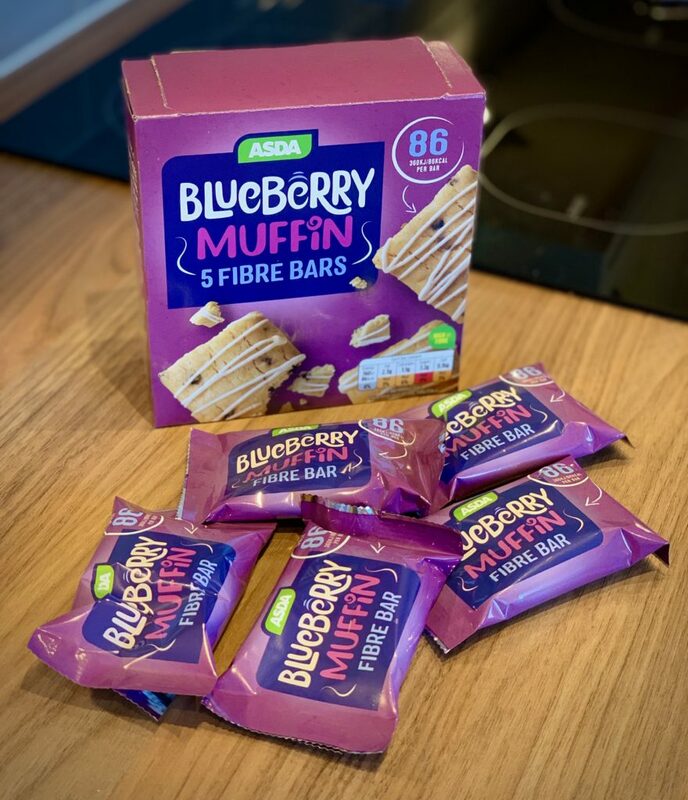 I must not forget to mention the Blueberry muffin fibre bars. These were not as exciting for me but I had nothing really to compare them against as Fibre One do not currently stock a similar flavoured product. 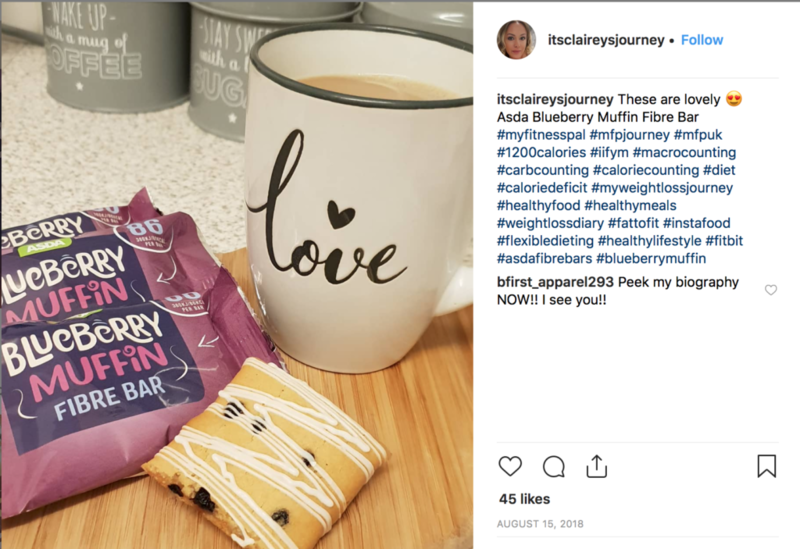 If you enjoy a fruity cake bar rather than a chocolatey one they are tasty, not too sweet and still only 4 Syns on the Slimming World plan. They do taste very similar to an actual Blueberry muffin so if you are a fan I think you will enjoy them. Both products are available to purchase from Asda at the cost of £1.25 for a pack of 5 bars. My hope is that Asda will continue developing this product and introduce some new flavours.. a salted caramel would be perfect. 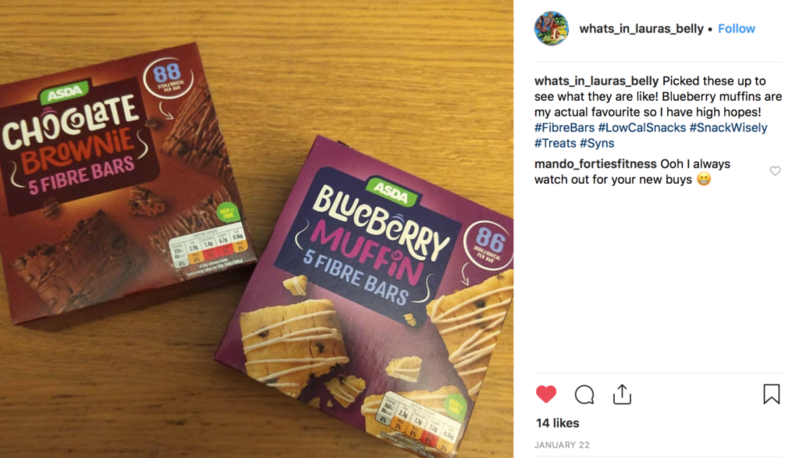 Everyone on Instagram is loving the new Asda Fibre bars too…. Thanks I will definately try the Asda ones, are they with the cakes or biscuits? Hello. On the strength of your review today, I purchased the Asda chocolate ones. They are lovely and chocolatey! Will definitely be swapping to these. Yes..Nice blog review. I will love to recommend reading this blog post to other mummy friends.